Fences are everywhere, from backyards to playgrounds to heavy industry. Among the most common styles, especially in commercial settings, is chain link fencing. There are several kits available to model chain link fences. Walthers, BLMA, and Precision Scale all make HO scale versions. Each manufacturer's kit has its own qualities, but the assembly procedures and finished results are similar. 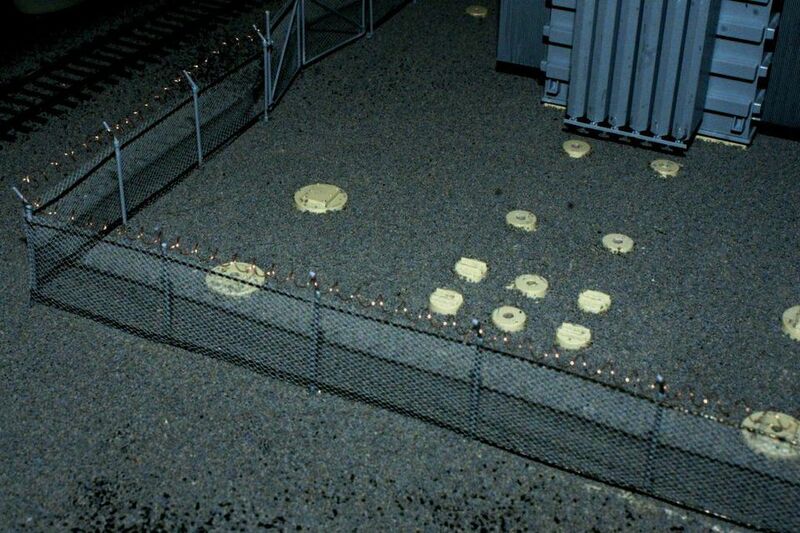 For this article, fencing from a Walthers power substation kit was used. The same fence is sold separately. Begin by installing the posts. The kit base has pre-spaced holes for this, but if you're not using that, you'll want to drill holes in your scenic base at scale ten-foot intervals. The posts need to be straight. This starts by keeping the holes plum. Once the posts have been glued and set in place, attach the wire horizontal support posts. Some of the wires in this kit were bent from packaging. To straighten wire, clamp one end in a vise and tug repeatedly on the other end with a pair of needle-nose pliers. After a few tugs, the wire will be straight. Attach the wires with cyanoacrylate (CA) glue. Use spring clamps to hold the wires in place while the glue hardens. Allow them to dry completely before attaching the mesh. Many fences have additional diagonal bracing in corners as well. These can be added in the same way. Once the frame for the fence is in place, It is time to add the mesh material that replicates the wire fencing. Before it can be attached, the mesh must be painted and cut to size. Use spray paint to color both sides of the mesh. Silver, gray and dark green are common colors. Any brand of paint will do. Always paint in a well-ventilated area. Once the paint has dried, the mesh sheet can be cut into strips. To make this easier, attach the mesh to a sheet of contact paper. This material has one sticky side and can be found at most craft and home stores. The paper is tacky enough to hold the mesh during cutting, but it will pull off easily later. Take care to lay the mesh flat and prevent wrinkles. Measure the height of the fence and cut strips of the mesh to match. Twelve scale feet is typical. Use a straight edge and sharp hobby knife to cut the mesh. With light pressure, you can cut through the mesh without cutting through the contact paper. The mesh strip can then be peeled off of the sheet and you move on to the next one. With the mesh complete, attach it to the frame of the fence with CA glue. Start at one corner and gradually roll the fence along the fence, being sure to keep it straight. You can wrap the fencing around corners for a continuous strip, or splice smaller strips together as necessary. At this point, your fence may be nearly complete. Just touch up the wires and poles with a little gray paint. The Walthers fencing used here has extensions for barbed wire. Although not included with the kit, this detail is easy to add. Read on to see how. For added security, many fences feature a coil of barbed wire along the top. This distinctive little detail is fun and easy to add to model fencing. You'll need some thin wire and a small screwdriver. To get the thin wire, remove the insulation from some small gauge stranded electrical wire. The stuff you use for your lighting and accessories works well. Remember, you are going to need about 3-4 times the length of wire as the length of the fence. To coil the wire, use a small screwdriver or similar tool. The size of the coil will be determined by the size of the tool, so this technique works ​with any scale. Wrap the wire around the shank of the tool. You can wrap it in larger loops to avoid overlapping the wire across itself. Then simply tighten the coils to one end and continue. Once you've run out of wire or screwdriver, slide the coil off the end. It should spring nicely. You will be able to stretch the wire back out during installation, still keeping a consistent coil. With the coiled wires complete, they are ready to be installed on the top of the fence. Begin by attaching the coil to one corner with a drop of CA adhesive. Stretch the coil to the end of the fence, the next corner, or as far as it will reach, whichever comes first. Attach the wire at the other end with a drop of CA. This should provide a consistent coil length across the entire length of the fence. Attach the wire to each of the intermediate posts with CA. Trim off any excess wire if necessary. With the barbed wire in place, you can finish the fence with a little paint on the wire, and any other posts/bars that need to be touched up. Gray works well. A small brush should make short work of the project. You can also add signage around the fence, such as business names or warning/no trespassing signs. There are many decals available for signs like these. You can use them right on the backing or apply them to thin styrene and glue them to the fence. With that, your property has been properly secured! Once you get the hang of it, installing these delicate details actually goes pretty quickly and can be a lot of fun.